Fed up with dietary disinformation that led to his mother’s illness, Max Lugavere became an expert on cognition and nutrition. After his mother was diagnosed with a mysterious form of dementia at 58, Max Lugavere put his thriving media career as the “core expert” on Dr. Oz and host of a show on Current TV on hold. He began a decade-long journey to study the inner workings of the human brain—information that he wasn’t getting from doctors. Lugavere condensed his findings into the New York Times best-seller Genius Foods, a practical road map to optimal brain health, as well as a documentary, Bread Head, the first film about dementia prevention through diet and lifestyle. Integrative health coach Amanda Cole breaks gluten-free bread with the author. You dedicated your book to your mom, who you call “the first genius you ever met.” And you began this rigorous research quest for conclusive answers when she was diagnosed with a neurodegenerative condition. What are some of the lessons your mom has taught you? MAX LUGAVERE: She taught me to not fear authority, and to always challenge what I was being served. I do feel that in many ways my mom was victimized—that’s why I am happy to confront haters or skeptics. When people ask me how it’s my place to be a voice in health, it’s because the people we’ve trusted for so long really were complicit in leading the country astray when it came to dietary recommendations. Our current dietary guidelines are not evidence-based. That’s why there’s a part of me that is angry and wants to try to improve the system. 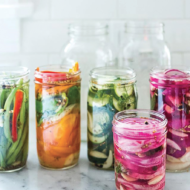 The title of the book, Genius Foods, indicates that there are some diet-based solutions that will help readers become “smarter, happier, and more productive.” Yet food is only one ingredient to the solution you present. 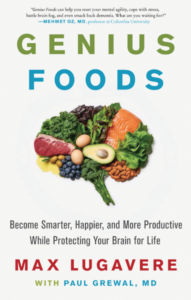 ML: In Genius Foods, I highlight 10 foods—olive oil, avocados, blueberries, dark chocolate, eggs, grass-fed beef, dark leafy greens, broccoli, wild salmon, almonds—with a robust body of evidence showing that they will enhance your brain function. Whether it’s the nutrients in those foods or the foods themselves, these are the foods that are the most nutrient-dense. What is cool about Genius Foods is it is not just a diet book. It’s more a guiding philosophy of health for the modern human. It’s deeper than “eat more blueberries.” In Genius Foods, we look through the lens of evolution. We look at the conditions and the diet that our ancestors might have consumed during the time in which our brains evolved. Obviously, there are certain foods that have fundamentally changed since our evolution, but it’s about emulating that diet and lifestyle in the modern world with a specific focus on brain function. Why are neurodegenerative diseases so prevalent today? ML: The brain has specific needs that are being unmet by the modern diet and lifestyle. Healthy brain function should be a right given to everybody, yet today it is a privilege afforded to very few. Everything from diet to how we live our lives is so far removed from the conditions in which our brains evolved. On one hand, we are highly adaptable, which is why humans have been so successful as a species. On the other, it’s also the reason why one in six adults is on, or has taken, some sort of psychiatric drug; why one in seven young people complains of memory problems; and why ADHD is ever-increasingly diagnosed. We try so desperately to fit our brain into the modern world, and appease the modern demands during the week, and then during the weekend we go overboard with escapism. We binge, we drink, we go overboard with crazy festivals. We sit in isolation at our desks and then on weekends we indulge in self-destructive behavior to essentially smash our separateness. I think that’s a shame. We can be so much more, and feel so much better, if we just adhere to a few simple principles. A while back, I learned about Jiddu Krishnamurti. His whole idea is that conditioning is the death of truth. Culture and allegiance to tradition is there to blind you to reality. I became really obsessed with him all throughout college, and I never thought of that obsession in context of what I’m doing today, but it had to have helped me with revolting against the dietary conditioning I grew up with. I was told for decades certain things were good for me or bad for me. This philosophy helped make it really easy for me to just question everything. He’s a spiritual philosophical teacher who informed my dietary quest. ML: How do you guide someone to think critically and become their own health advocate and detective? I really think it’s all about asking questions. Don’t be afraid to ask questions and seek answers. That’s what science is. Science isn’t owned by academia or universities or physicians. It’s simply a method, the scientific method. It’s a way of asking questions and finding answers. Anybody can do science. What does the instant success of your book tell us about this moment we are in? ML: I think it says that people want more than the 15 minutes they are getting in the room with their doctors. They want more than the click-bait headlines we see come at us from every direction on the internet. They want more than the food marketing that is able to say almost anything these days, or even food-like products it sells us. We live in a time where it has become way more difficult to put one past society. It takes 17 years for scientific findings to be translated into medical practice. I think people really get my mission.